Amy and I were married on September 18th. The wedding went incredibly well and we departed late the next day for our long-anticipated and very welcome (after a year of chaotic and angstful wedding planning) honeymoon, a fortnight in the farthest away place we could think of... New Zealand. It's an incredible place and was an action-packed two weeks. We took a lot of photos and I could easily produce a gargantuan web page. Happily, this is the condensed version of what happened with a few representative photos to show you what it looks like. The day after the wedding, we flew to Los Angeles (2 hours) and thence to Auckland (12.5 hours). The flight was long, but not too bad and the time difference (6 hours) was better than I thought it would be. We met a lovely couple named George and Karen on the plane who were native kiwis. They compiled a nice set of notes for us of places to stay, things to visit, and places to eat. Auckland is a very Seattle-like city and has a very Pacific-Rim feel. It was colder than we expected and rained off-and-on most of the day. We wandered about in a daze seeing city sights not much different from things you might find in any US city and decompressing from the flight and wedding hulabaloo. The next day we picked up our car and learned how to drive on the left side of the road. It's surprisingly easy after a day or two, but the first ten minutes, especially in down-town traffic at rush hour, is terrifying. Auckland's most recognizable man-made landmark is the Sky Tower. For $18, you can take a glass-bottomed elevator to the top (~200 meters) and get a view in all directions. Looking north you see Rangitoto Island which is only 800 years old. Two other older volcanoes can be seen in the foreground. Outside the city, we headed south for Rotorua via Tauranga and Te Puke on the Coast (also the chief kiwi-growing region). Rotorua is in the middle of the volcanically active part of the North Island and also home to a lot of the Maori cultural attractions. It's also pretty much the biggest tourist hell-hole in the country, crowded with tour busses, tacky attractions, and overpriced hotels. The fact that it was spring break didn't help. We found a nice Holiday Park a ways out of town which was quiet, scenic and affordable. 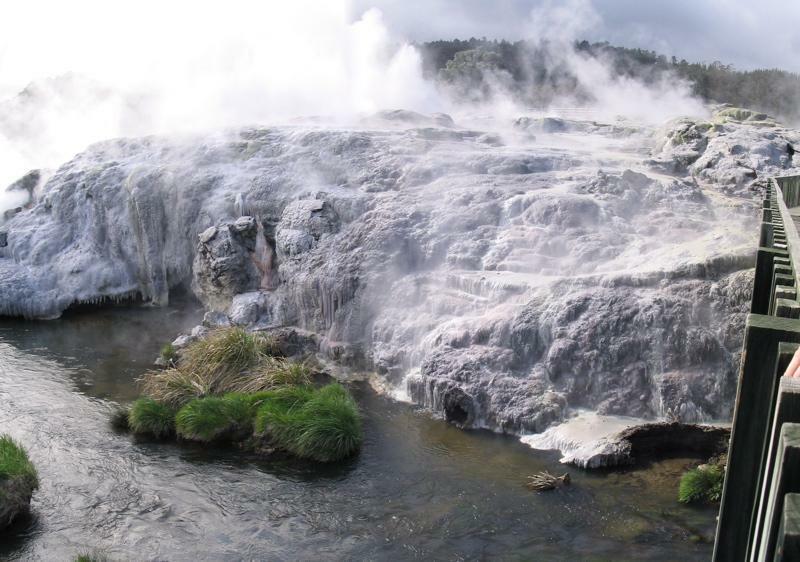 Whakarewarewa in Rotorua is home of several geysers, bubbling mud, and a lovely sulphurous smell. We spent a while walking through gawking at it all. Whakarewarewa is also the home of the excellent Maori Arts and Crafts Center where many of the old carving, weaving, and oral traditions are being kept active by a skilled group of students. After lunch, we visited Waimangu Volcanic Valley, which is south of Rotorua about 20 km on the Thermal Explorer Highway. This was very different from Whaka; a nearby volcano erupted in 1886 and caused a 4 km long string of craters to appear nearby in previously uncratered terrain. We hiked the length of the valley past four lakes with the most surreal atmosphere I've ever seen. There were no geysers or bubbling mud, but the lakes were a startling blue color and steamed continuously. Various hot water and steam vents, from several meters across to finger sized, could be found in the strangest places and there were sinter terraces of various wild colors as well. When we had gotten down to the Lake Rotomahana, a bus drove us back up to the visitor center. Amy at the gates of the Whaka thermal reserve and Maori Arts and Crafts Institute. First up, a lovely pool of bubbling mud. The Pohutu Geyser and several subsidiary geysers. The white is all deposited minerals from the hot water. Finding the granary empty (behind), Charles announces "I will eat you!" Finally, we attended a hangi or traditional Maori feast complete with concert. I was dragged up on stage to help demonstrate a haka or war dance complete with lots of chest slapping and tongue sticking-outing. If you've seen 'Whalerider', it features prominently. The chest slapping is a macho thing and the tongue stuck out thing means 'I will eat you'. The experience was one of the few negative ones we had in NZ with the food overpriced, the concert sub-par, and no vegetarian option. The next day we headed south to Lake Taupo, the remains of the largest volcano to appear on Earth during the last million years (the lake occupies the old crater and the far side of it is over the horizon). We visitted Huka Falls, an impressive chasm where a large quantity of water comes tearing through a narrow rocky gorge at great speed before going over an 11 meter waterfall, and then did a short hike along the river. Later, we visitted a third geothermal area, Craters of the Moon. This was simply a wide valley with many steaming, hissing craters. A walkway took us on a long loop through them all. Each geothermal area was quite unique and all of them were unlike anything I've ever seen before. The only common factor in all of them seems to be the sulphurous smell, which really wasn't so bad. Fascinating! Fryingpan Lake is the second crater in Waimangu Volcanic Valley and dates from 1886. It's bright blue and steaming from the hot water vents in its depths. The water is warm to the touch. Taupo, the town, was much more agreeable than Rotorua. We wandered the main drag for an hour or two before having the best Thai food either of us has ever had and a place with the inauspicious name of "Tasty Thai". We have a theory that ethnic food becomes better the closer you are to its region of origin and this seems to bear it out. Similarly, we had the best sushi I've ever had while in Auckland a few days before. Reportedly, Mexican food in New Zealand is horrendous. Inferno Crater at Waimangu is smaller than Fryingpan Lake. It is 50 meters deep, about 50 meters in diameter, 80 degrees C, and has a pH of as low as 2.1. Don't touch! It's also the largest under-water geyser in the world. A random mini-geyser spring at Waimangu in the middle of the creek. There was a wonderful hissing, bubbling sound and a faint smell of rotten eggs. The professionals show us how the haka is supposed to be done. Amy at Craters of the Moon. Next we headed west to Waitomo (wai=water, tomo=hole) which is famous for its glowworm caves and 'blackwater' rafting. The glowworms are bioluminescent larva of a particular fly that spin long, sticky strands from cave ceilings to trap insects in. Individually they are very faint and hard to focus on, but en masse they look like a planetarium show. The town of Waitomo is tiny and entirely driven by the various ecotourism outfits. With so much to choose from, we toured the Museum of Caves and then did a 3-hour tour through Ruakuri Cave, one of the wilder caves in the valley. The guiding company outfitted a group of 12 of us in wet suits, helmets, inner tubes and rubber boots and we set off in a van for the cave. Our guides were Sarah and the indomitable Cory and they were wonderfully off-beat and wacky and the guiding company proved that they were worth every penny of the price. There was a certain casual attitude that would never fly in the States for such a commercial venture. "Just grab your tube and leap backwards off this waterfall into the dark. Oh, and make sure you leap far enough because there's a rock right below you." No problem, but it would be lawsuit-city in the USA. We walked through a few hundred yards of dry cave and then interspersed walking through shallow, rushing water with occasional bits of floating. After leaping off the waterfall mentioned above, we mostly floated through 60' tall canyon passage illuminated by glowworms. In the final bit of cave, we floated downstream by ourselves, lights off, watching the subterranean 'skies', being carried by the current to the cave exit. I've done a lot of caving in the US, but this was definitely a new experience for me. Wonderful! We didn't risk the camera in those wet contidions so, saddly, we don't have any photos. However, here are links to representative photos (1, 2, 3, 4, 5, 6). We also took in the Otorohanga Kiwi House and native bird preserve which was extremely well done. New Zealand lacks any indigenous mammals (save two species of bats) and thus birds have evolved into many of the typically mammalian niches. Oddest of all are the kiwis, the nocturnal, ground-dwelling, insect eating national mascot and icon. We saw several sets of kiwis which bear an uncanny resemblance to the fruit. They're quite large (basketball or larger) and appear very front-heavy and cuddly. Looks are deceiving, however, as they are territorial and extremely fierce. We watched one being fed and she would leap up, grab the pants of the keeper, and kick powerfully. They can also run amazingly fast with this very long, loping stride. Very bizarre birds. We finished our tour of the North Island with an evening drive to the uninteresting town of Hamilton, a stay in a motel, and a morning drive back to the Auckland Airport under refreshingly cloudless skies. Our introduction to the South Island was a spectacular flight along the spine of the Southern Alps which run the length of the South Island. Most New Zealanders live on the North Island so the South is largely devoted to huge sheep farms, huge, jagged mountains, big lakes, and lots of basically inaccessible terrain. Landing in Queenstown involved some very exciting maneuvers (all by the 'seat of the pants' apparently) which I hadn't thought a 737 could carry out. Queenstown is a small tourist town set on a long, Z-shaped lake in the midst of some spectacular scenery. It is also the adventure sports capital of the world and you can do para-bungie jumping (a bungy jump from a parasail being towed behind a speed boat) and any other adrenaline-junky activity you can imagine and/or afford. As a result, the town is very high-end touristy and not nice at all (except the scenery). The scenery, however, is breathtaking. If you've seen the Lord of the Rings, well, it really does look like that! A lot of scenes from the movies that I'd thought were matte paintings or computer graphics are in fact available as roadside panoramas a short drive from town. Surreal to say the least. We opted to explore the scenery for free rather than pay loads of money to go sky diving or whatever. Lake Waikatipu and the Remarkables, the backdrop for Queenstown and our introduction to the South Island A random roadside scene driving through the mountains near Queenstown. Kiwis love their swing bridges! We encountered 4 in just 6 km of hiking. The trail conditions were great almost everywhere else as well. The incredible Routeburn Flats 6km along the famous Routeburn Track. First up was a wonderful day of hiking on the Routeburn Track, a famous 3-4 day backpacking route through some impressively steep mountains at the north west end of Lake Waikatipu about an hour's stunning drive from Queenstown. The kiwi approach to hiking trails is wonderfully posh with well-graded, guttered trails of even gravel, numerous bridges, many signposts (with distances measured in hours rather than kilometers), and periodic bunkhouse 'huts'. We only did the first 6km or so, but it featured waterfalls, a spectacular gorge, rainforest, open meadows, and toothy mountains on all sides. They're not nearly as tall as the Colorado peaks, but they're much younger and steeper and thus more impressive looking. It's still early spring down there so they were covered in snow on top and sheep on the bottom. We probably saw a couple hundred thousand sheep on this trip, all of them with lambs, all of which were devestatingly cute. We headed south and west from Queenstown to the smaller, 'realer' town of Te Anau which is the main base for exploring Fiordland National Park on the south west coast of the south island. We did a short hike on the Kepler Track to a wildlife sanctuary and then a longer hike (which featured 40 km of dirt road driving each way through giant sheep farms) to the Mavora Lakes. The incredible North Mavora Lake. If it looks familiar to you Lord of the Rings fans, it should. Mavora was the lake shown at the end of the first movie and the gravel beach on the right is where the Fellowship beached their boats. Our day, however, was foggy and pouring with rain (this is not atypical for a region that receives up to 12 meters of rain a year). Rather than being wet, miserable, and clogged with camera-wielding bus loads of Japanese tourists as I'd feared, the conditions were perfect! Thousands of waterfalls of all sizes poured off the unreasonably steep, jungled mountains which rise a kilometer or two straight out of the water. All the disruptive flights were grounded and the cruise ships were at a minimum as well. Our group was eight paddlers from various countries in the English-speaking world equipped with tandem kayaks and an entertaining assortment of wet-weather gear. Our intrepid guide Will paddled along with us while supplying local legends and pointing out features in the amazing scenery. Mist shrouded the walls of the Sound and the rain came and went rendering life damp but not unpleasent. The wind was practically nil and the water was smooth as glass. A few kilometers away we could see one of the cruise ships dwarfed by the 150 meter waterfall that poured out of a hanging valley. The the walls went a lot higher than that! Incredible place. Looking toward the Tasman Sea down the 22km length of Milford Sound. Stirling Falls in the distance is 156 meters tall. Will points out the waterfalls pouring straight off the snowfields up above the clouds. The cloud deck is at about 1000 meters. Will lead us along the south shore into inlets under steep cliffs, through waterfalls and the wake off the cruise ships. We crossed to the north shore after about 5km of paddling where we disembarked on the only bit of level ground I'd yet seen in the Sound. Will made tea for everyone and we stomped about getting the blood circulating again and eating lunch in the light rain. All told, we saw three New Zealand Fur seals, a rare Fiordland Crested penguin, and, in one of the most amazing experiences of my life, a trio of dolphins leaping and playing about 10 feet from our kayak! It was so cool, in fact, that none of us paid any attention to the 150 meter Niagra-grade waterfall right next to us. Eventually, we fought the current back to the fishing wharf at the head of the Sound and headed back to Te Anau, stopping for various scenic opportunities along the way. Fantastic trip with a great guide and good company! This kea will eat your car! These cheeky alpine parrots frequent mountain car parks and look for handouts, but will happily chew on the rubber gaskets around your windows. The happy couple on the way back to Te Anau from Milford Sound. From Te Anau, we drove a long, 8 hour day back up through Queenstown and across the Haast Pass to the Westland on the west coast. 8 hours of driving doesn't sound too bad until you realize that NZ has a very limitted system of multi-lane highways. Most roads are two lanes, steep, winding, lacking guard rails, and fraught with one-lane bridges. All of this on the 'wrong' side of the road. Driving is spectacular but exhausting! Three views of the Westlands. 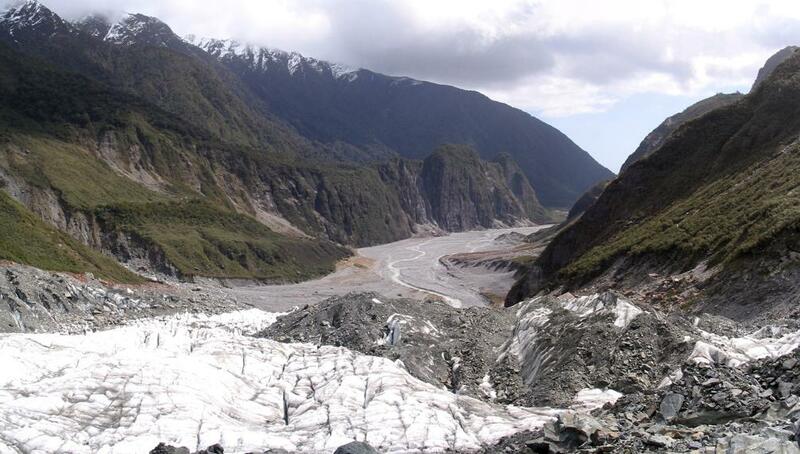 The Westland's biggest tourist draw is the pair of glaciers that pour off the western slopes of Mounts Cook and Tasman, highest peaks in the country. We stayed three nights in the town of Franz Josef (the northern glacier) and spent a wonderful full day trekking about on the Fox Glacier (the southern glacier). The guiding company was marvelously old-school supplying instep crampons and alpenstocks (a broom handle with a nail in one end). They transported us in groups of 8-10 to the parking lot and we hiked a long trail through the rainforest at the side of the glacier. Finally, we descended to the edge of the ice, donned our crampons, and went stomping around. The guides go ahead and chop steps with huge pickaxes. I've spent a bit of time on the glaciers and snowfields we have in Colorado, but these are a completely different species. The ice is white in some places, but dirty grey in others and completely covered in broken rock in some. They flow at the rate of a meter a day and are crossed with crevasses, ice caves and other goodness. Having a guide was essential! The fact that this glacier terminates in a rain forest made it even more surreal. The view out our window the first morning in Franz Josef. These are the smaller mountains in front of the bigger ones! The down-hill end of the Fox Glacier. Looking east up the glacier toward the icefall. The neve where the glacier forms is quite a ways beyond that. Looking out of a particularly large crevasse. This is not the view you'd want to come upon suddenly. Looking down toward the Fox Glacier terminus from high on its slopes. The cliffs on the left of the valley are 250 meters tall. Our party consisted of Matt our guide and nine tourists from Sweden, Scottland, Australia and Canada. With the exception of two twits, we all got along very well and retired to the local pub afterwards for a few pints and dinner. A fine time was had by all. On the way back over the twisty, exciting roads to Franz Josef, we stopped at the side of the road to look at the stars. The sky was dark as pitch and covered in vast twinkling starfields of unfamiliar constellations. The Magellanic Clouds were clearly visible on one side of the sky and the Southern Cross and Milky Way were clear on the other. In the dark, windless woods on all side of us, we heard a morepork (a small owl) calling forlornly. Beautiful but chilly. We hurried back to our abode and slept soundly. The summit and east crater of One Tree Hill in Auckland. Our last day, we drove a long five hours back through the Haast Pass in pouring rain to Queenstown. Our flight back north to Auckland was not nearly as scenic as the flight down, but we were so tired at this point, we didn't really care anymore. In the half-day we had before our transpacific flight, we wandered about Onehunga, one of the more working-class areas of Auckland, and up to One Tree Hill. One Tree Hill was made famous by the U2 song and is one of the many small volcanoes which make up Auckland. It erupted about 20,000 years ago and is now covered in sheep, grass and trees. The Maori recognized its strategic importance immediately and terraced the steep craters and installed fortifications. The terraces and ditches are still there and the one tree has been replaced by a large obelisk. Great views and interesting history. Finally, we boarded our plane (at 5pm on Tuesday), flew to LA and then on to Denver and arrived back at our house (at 5pm on Tuesday). Great, once-in-a-lifetime trip.